Our new book is now available in Danish. It’s a guide to a more visual way of working. Our hope is that it will strengthen the way leaders, facilitators, teachers, students and entrepreneurs think, communicate and collaborate. How can weekly meetings feel a bit less like weekly meetings? What does a shared language for engineers and designers look like? Book Reception "Tegn mere sammen"
Join us this afternoon where we celebrate the launch of our book with a short presentation, a guest speaker, a visual exercise and champagne. 15:15: Loa and Ole bid welcome and present the idea and content of the book. 15.30: Dialogue with Futurist Anne Skare Nielsen about skills of the future. You can read more on the book website here. Join us for this two-day training hosted by our partner DM Efteruddannelse: Learn to create your own visual language and design processes using a bigger picture approach. Go to “Training” for detailed description. In Denmark there are 550 free schools with about 110.000 pupils. At this year gathering there will be around 700 participants. 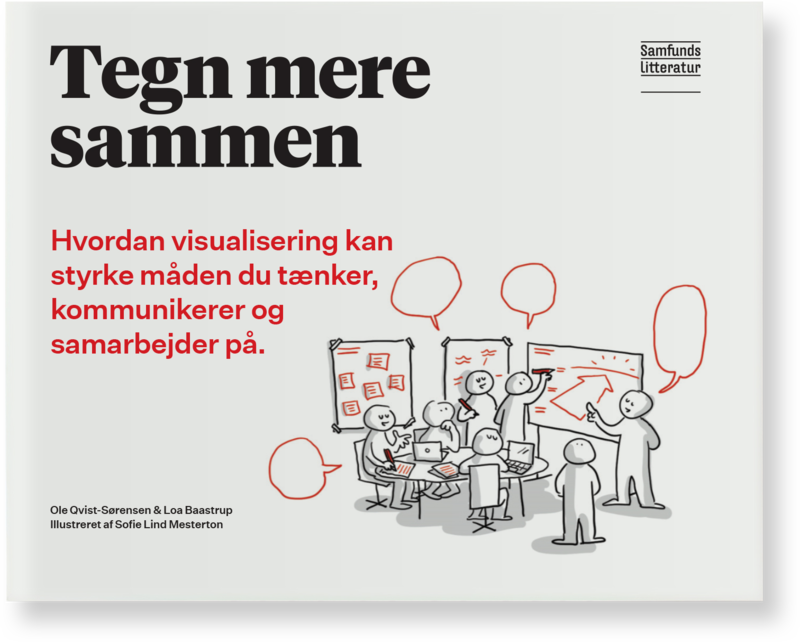 We will be delivering a keynote and a workshop about the power of using visuals in teaching (langauge: Danish). For the second year in a row we will be contributing to the AAU Teaching Day 2019 program. 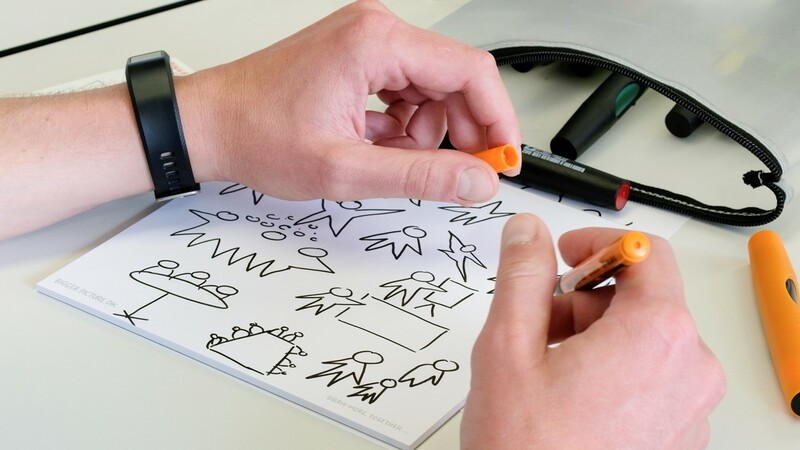 We will deliver a mini-workshop on visual facilitation in teaching. Meet us at the annual international gathering of people from the visual field. We will host a workshop on our upcoming book and share our method and tools for a more visual way of working. School of Communication and Media at Montclair State University, NJ USA. July 30th to august 2nd. We use many different brands when we choose analogue tools. One of our favorites is Neuland. They have recently launched a new set of stickie notes – estatic. They can be put on most surfaces and moved around. A great tool for visual collaboration. Maersk, LEGO, Schindler, Roche, IKEA, Novozymes, Vestas, GEA, Tata, Sappi, COWI, COOP, Lundbeck, Grundfos, Haldor Topsoe, Danfoss, Radiometer, Shire, Baxalta, Coloplast, Vifor Pharma, Hartmann, PwC, Bain, Aller, Carlsberg, Deloitte, GN Resound, Ørsted, Getinge, Takeda, Siemens, Triodos Bank, Nets, PFA, Global Alliance for Banking on Values, Merkur Andelskasse, Solar, Axon, Spar Bank Nord, Jyske Bank, Sandoz, BBC, DNV GL, Allianz, Rambøll, Ferring, Mars, Kraft, Alfa Laval, Svitzer, NNE Pharmaplan, Arla Foods, JN Data, Telenor, Carlsberg, Kirkbi A/S, Novartis, NNIT, Gucci Group. Danish Ministry of Education, Danish Ministry of Taxation, Region Hovedstaden, Royal Danish Library, Metro & Lightrail, Hovedstadens Beredskab, Municipalities of Gentofte, Slagelse, Kalundborg, Horsens, Frederiksberg, Esbjerg, Roskilde and Albertslund, Danske Friskoler, Borupgaard Gymnasium, Rungsted Gymnasium, Danish Radio & TV, Norwegian Radio & TV, Kaospilots, Technological University of Denmark, Aalborg University, Roskilde University, Aarhus University, Copenhagen Business School, Lviv Business School, NEXT, Kolding Design School, Sundhed.dk, Danish Health Authority, Energinet, HOFOR, Banedanmark, VIVE, the Danish Police. The Danish Institute for Human Rights, The Global Fund, WWF, International Red Cross, Action Aid, Danish Red Cross, Danish Church Aid, 3F, The International Union for Conservation of Nature (IUCN), Climate Action Network, Børns Vilkår, LIFE, Elsass, Lego Fonden, European Commission, UN, United Nations University, UNDP, UNFCCC.